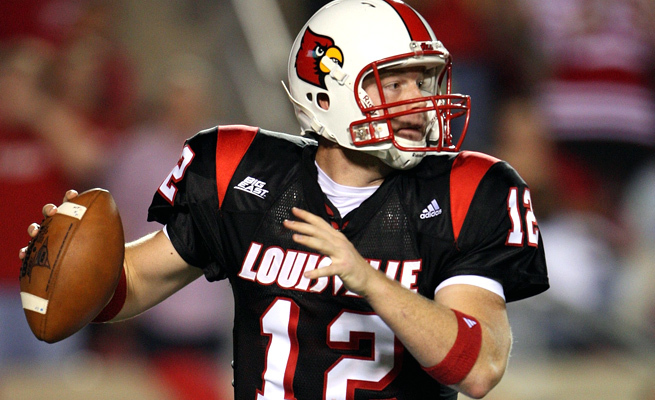 Published: April 21, 2008 at 09:16 p.m.
Louisville's Brian Brohm closed out his career as the Big East's all-time leader in passing yardage. Went to Hargrave Military Academy in 2004 and then started every game for Virginia the next three years (35 games at left guard, two at left tackle). ... Has very long arms -- 35½ inches. ... Best trait is overall athletic ability. ... Has not played a lot of football (only two years of high school). ... Note: Could move up into Tier One. Improved his 40 time from the combine to his campus pro day (running a 5.12 40). ... Played but did not start as a true freshman in 2004, then started 22 games over the next three years. ... Best traits are strength and quickness for the position. ... Has long arms -- 33¼ inches. Played but did not start as a true freshman in 2004, then started 33 games in his final three seasons. ... Had a very good pro-day workout on March 24. ... Best traits are knowledge of the game and competitiveness. Note: Could slide down to Tier Three. Was a defensive lineman when he arrived at Boise State. ... Redshirted in 2004 as he switched to OL, then started 32 games over the past three years -- 26 at left tackle. ... Best traits are great feet and long arms (36¾ inches). ... Note: Could move up into Tier One. Born in Nigeria, came to the U.S. at age 7. ... Played two years at Valley Forge Military Academy (2004-05) and then started 24 games the last two years at Pitt. ... Best traits are strength and toughness. ... Has long arms (35 3/8 inches). ... Note: Could move up into Tier One. Ran an impressive 4.33 40-yard dash at the combine and a 6.74 cone drill (tied for tops among cornerbacks). ... Arrived at Tennessee State in 2004 and started every game (44) in the four years he was there. ... Best traits are speed and quickness for the position. Stewart ran a 4.46 40 at the combine and is very strong for a RB. ... Played as a true freshman and started one game in 2005, then started 22 games over next two seasons. ... Also an outstanding kick returner. ... Best traits are quickness and strength. ... Note: Recovering from toe surgery, which teams must take into account. Had a 37-inch vertical jump at Texas' pro day and he's got long arms for a receiver (33 3/8 inches). ... Redshirted in 2003 and then started 39 straight games until sidelined with a wrist injury in the Iowa State game midway through last season. ... Best traits are leaping ability to make catches and a burst of speed after the catch. ... Note: Could slide down to Tier Three. Has long arms (32 7/8 inches) and big hands. ... Played two years in junior college at Coffeyville (Kansas), then started one game at Michigan State in 2006 and 12 games in 2007. ... Set a Big Ten record for kickoff returns, and his return skills help his draft status. ... Best trait is great speed/size combination for the position. ... Note: Could slide down to Tier Three. Redshirted in 2003 and did not play in 2004. ... Was undersized when he first arrived at Vanderbilt. ... Best trait are good feet and balance for pass protection -- well-suited to play left tackle.